The iconic Jeep® Wrangler – the most capable and recognized vehicle in the world – moves into 2015 with updates designed to further enhance the Wrangler ownership experience. The combination of open-air freedom, off-road capability and on-road refinement has brought Jeep Wrangler’s popularity to an all-time high. 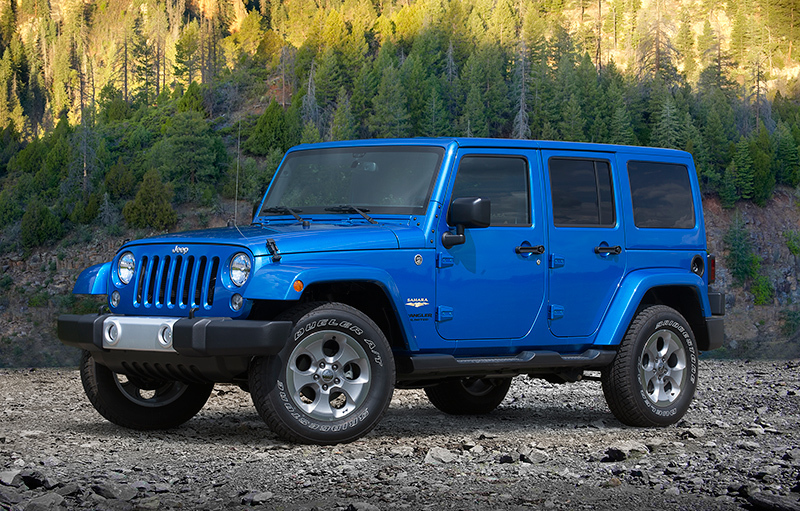 For the 2015 model year, the Jeep Wrangler has new features that are sure to continue that trend. The Jeep Wrangler Freedom Edition returns for 2015 and offers great value with unique exterior and interior appointments. Jeep will donate $250 from each Wrangler Freedom Edition it sells to the United Service Organizations Inc. – or USO – as part of the Jeep Operation Safe Return initiative. Jeep Wrangler Willys Wheeler, the widely popular model that salutes the earliest civilian Jeep vehicles with additional off-road hardware for increased capability, also returns for 2015. Jeep Wrangler has always had a unique variety of colors to choose from, and 2015 is no different. New exterior colors include: Baja Yellow, Copper Brown, Firecracker Red, Sunset Orange and Tank. Anvil, Billet Silver, Black, Bright White and Hydro Blue continue for 2015. The Rubicon Hard Rock Edition, available on either two-door Wrangler or four-door Wrangler Unlimited models, is the most capable Wrangler in the lineup. Based on the Rubicon model, it is equipped with Wrangler’s part-time four-wheel drive system that has electronic-locking front and rear Dana 44 axles that receive power through a Rock-Trac transfer case with a “4-Low” ratio of 4:1. A 4.10 axle ratio, front and rear, is also standard as are Tru-Lok locking differentials. With a six-speed manual transmission, the Wrangler Rubicon Hard Rock edition has an impressive crawl ratio of 73.1:1 that makes it a breeze to negotiate any obstacle. The Wrangler Rubicon Hard Rock Edition has many features that make it distinctive, as well as the most off-road capable Wrangler. BF Goodrich KM 255/75R17 tires are mounted on 17-inch Rubicon aluminum wheels painted satin black with polished faces and a red Jeep Wrangler “icon” logo on the inside pocket. A Low Gloss Black grille with High Gloss Black inserts and Jeep badge and black front and rear steel off-road bumpers toughen up the exterior, with the front bumper featuring removable end caps and a winch-capable design. These removable end caps help the Wrangler climb obstacles without hindrance, and reduce the damage potential to the bumper system. 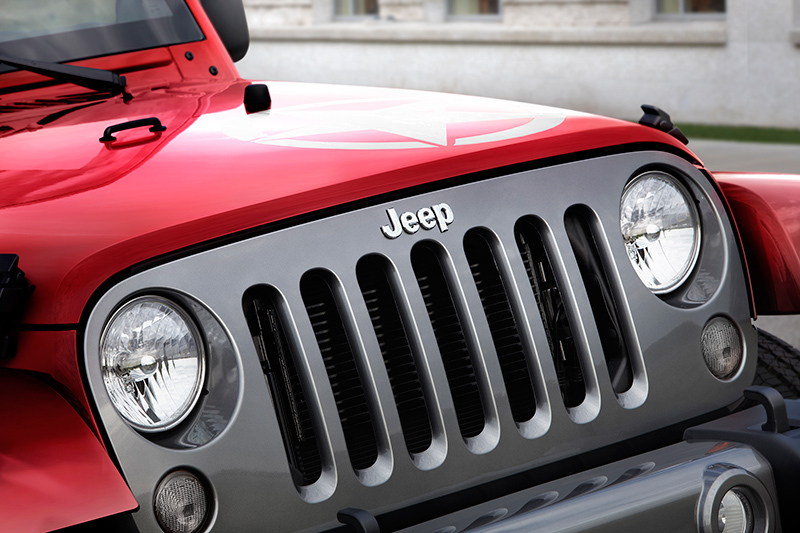 A dual-intake Power Dome hood helps aid in engine cooling and gives Wrangler a more menacing appearance. Red tow hooks adorn the front and rear, and Mopar wide off-road rock rails give added protection from trail damage. Mopar also supplies the black fuel filler door. A red-silhouette “Rubicon” decal, on both sides of the hood, adds the finishing exterior touches to distinguish the Jeep Wrangler Rubicon Hard Rock Edition’s added capability. The Wrangler Rubicon Hard Rock Edition comes standard with the all-new nine-speaker Premium Alpine audio system, and a Premium Sunrider soft-top and is available with a black three-piece Freedom hardtop or body-color hardtop and wheel flares. Final design touches include Mopar slush mats, Jeep Trail Rated Kit and unique axle locker and sway-bar disconnect switches. Based on the Wrangler Sport model, the 2015 Willys Wheeler Edition features upgraded hardware, including a Dana 44 rear axle with Trac-Lok limited-slip rear differential and 3.73 gears, BF Goodrich KM Mud Terrain LT255/75R17 tires, rock rails and a Jeep Trail Rated Kit that includes a D-Ring, tow strap and gloves in a Jeep-branded bag. This works with the Jeep Command-Trac 4×4 part-time, two-speed transfer case with a 2.72:1 low-range gear ratio to give the Jeep Wrangler Willys Wheeler Edition its improved off-road chops. Special exterior design cues include a gloss black grille with black Jeep badge, gloss black front and rear bumper appliques, historic satin black “4 Wheel Drive” rear tailgate decal and “Willys” hood decals and unique high-gloss black 17-inch aluminum wheels. The Willys Wheeler Edition comes standard with a Sunrider soft-top and deep-tint sunscreen rear windows. A premium Sunrider soft-top and black-splatter Freedom Top are available. Willys Wheeler Editions feature the Connectivity Group with SiriusXM Radio, and Willys W-based models have the Power Convenience Group and premium tire-pressure monitoring system as standard. Jeep Wrangler’s iconic half doors are an option. The 2015 Jeep Wrangler Freedom Edition is a tribute to U.S. military members with military-themed exterior and interior design cues. Based on the best-selling Sport model, it is available as a two-door Wrangler or four-door Wrangler Unlimited model and is offered in six colors: Firecracker Red, Bright White, Hydro Blue, Billet Silver, Black and Tank. Jeep Wrangler Freedom Edition’s exterior features include new-for-2015 “Oscar Mike” fender badges and decals on the hood and rear quarter panels, Mineral Gray-painted 17-inch alloy wheels, Mineral Gray-painted grille and front and rear bumper inserts, body-color wheel arches, rock rails with matching black tail lamp guards and a Mopar fuel fill door, and a Sunrider soft-top with deep-tint rear windows. Interior treatments on the Jeep Wrangler Freedom include black seats with rugged tectonic fabric, an “Oscar Mike” logo embroidered on the seat backs in silver stitching, French Silver accent stitching on the steering wheel, doors, seats and front arm rest, and “Quick Silver” accents on the front passenger grab handle, door pulls and dash vent rings. Finishing touches include grab handles, Satin Chrome spokes on the leather-wrapped steering wheel, and Mopar Slush Mats. Other standard features include power windows and locks, remote keyless entry, a leather-wrapped steering wheel with audio controls, and UConnect Voice Command and connectivity group coupled with standard SiriusXM Radio. Chrysler Group’s 3.6-liter Pentastar V-6 engine – three-time winner of the prestigious Ward’s 10 Best Engines award – delivers 285 horsepower and 260 lb.-ft. of torque. It is engineered to provide a broad torque band with a focus on low-end torque, an essential trait needed for extreme off-roading. Engineers also designed the oil sump to provide oil to the pump even at extreme vehicle angles, and the alternator was placed up high so Wrangler can maintain its water-fording capability. Available with a six-speed manual or an available five-speed automatic, the Jeep Wrangler can achieve up to 21 miles per gallon (mpg). The 2015 Jeep Wrangler delivers unmatched off-road capability with legendary four-wheel drive and is produced with more than seven decades of 4×4 engineering experience. Wrangler continues to offer a body-on-frame design, front and rear five-link suspension system, live axles, electronic lockers, and is one of the few mid-size SUVs that offers a six-speed manual transmission – in addition to its five-speed automatic transmission. A best-in-class approach angle of 44.3 degrees, breakover angle of 25.5 degrees and departure angle of 40.4 degrees, helps the Jeep Wrangler scale the toughest terrain. 44 rear axle. The Command-Trac NV241, part-time, two-speed transfer case, features a 2.72:1 low-range gear ratio. In addition, an optional Trac-Lok limited-slip rear differential provides extra torque and grip in low-traction environments such as sand, mud or snow. The Wrangler’s interior combines rich styling, versatility, comfort and intuitive feature use. Highlights include automatic temperature controls, heated premium leather seats, power mirrors and steering wheel controls for vehicle systems. Large rear windows are engineered for greater visibility. A USB port connects to the media center, 12-volt accessory outlets are located throughout the Wrangler and a 115-volt AC outlet is available to power select three-pronged home electronics. The Jeep Wrangler’s signature features include: classic round headlamps, seven-slot grille, trapezoid wheel flares, removable doors, exposed hinges, a fold-down windshield and innovative removable tops and half doors that allow the Wrangler to retain the brand’s iconic appearance and function. Wrangler Rubicon and Sahara models share a body-color hardtop option, offering a premium appearance. 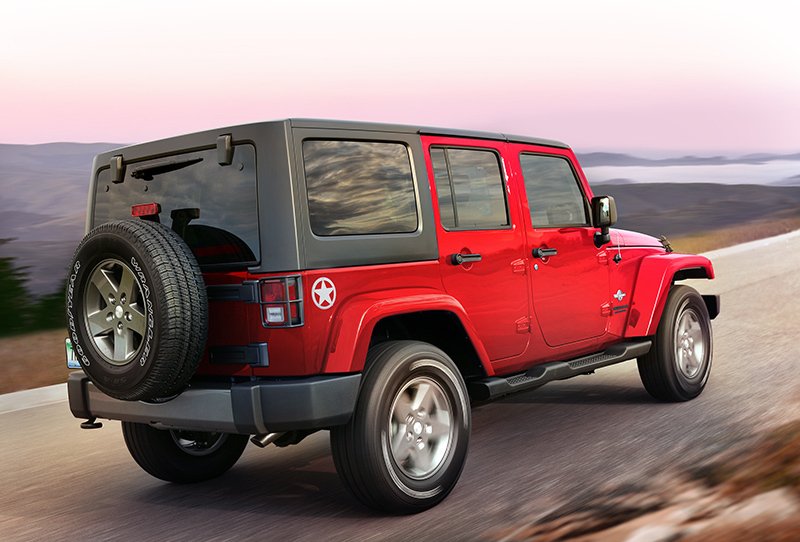 With room for five adults, Jeep Wrangler Unlimited remains the only four-door 4×4 open-air vehicle on the market. Jeep Wrangler stays connected with Uconnect systems, including voice recognition, Bluetooth streaming audio, navigation and SiriusXM Radio. The Wrangler’s connectivity systems have improved ergonomics by giving the driver control at their fingertips. Intuitive buttons on the front and rear of the steering wheel control a number of features allowing the driver to keep hands on the wheel and eyes on the road. The 2015 Jeep Wrangler and Jeep Wrangler Unlimited are built in the Toledo Supplier Park in Toledo, Ohio.